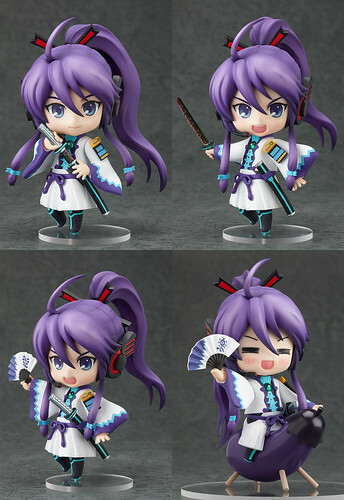 As mentioned by Mikatan on her preview post, Nendoroid Kamui Gakupo has been ready for pre-order starting yesterday. Gallantly riding into the Nendoroid world on his eggplant! The popular virtual vocalist ‘Kamui Gakupo’ is joining the Nendoroids! He comes with a variety of optional parts including his sword ‘Gakutou Mifuri’ and a singing expression that allow you to recreate the illustration from the original packaging. He also comes with a feudal lord expression and an eggplant so that you can display him riding valiantly on his eggplant mount! Apparently, the eggplant rider will be released on September with a price tag of 3500 Yen. This entry was posted in News and tagged gakupo, kamui gakupo, nendoroid, vocaloid.